Canadiens All-Star defenseman Mike Komisarek fondly remembers his first days in Ann Arbor, Mich., as a freshman defenseman for the Michigan Wolverines. "You walk into the dressing room and you see how amazing it is, then you see the banners, the arena, just the atmosphere and the mystique, you know you're in for something special," Komisarek said recently when asked to reflect on his two collegiate seasons. "But you really know you're at Michigan when Red Berenson walks in and starts talking. Right away he lets you know that Michigan is a hockey school and not just football. When he speaks, you listen and you can hear a pin drop in the room. That's when you know where you are and what you need to do to succeed there." What Komisarek had to do was not simply rely on talent alone, but work hard, be passionate about the tasks at hand and, first and foremost, listen to and heed the advice of one of college hockey's legendary coaches. "Red would just instill the tradition and what Michigan hockey is all about," Komisarek said. "It was such a joy to play for him and the fans at Yost Arena and I have nothing but fond memories. Playing in the outdoor game with Michigan State and going to the Frozen Four will always be some of my greatest memories." Colorado's Jordan Leopold will never forget his senior season with the University of Minnesota. Berenson remembers a young, raw talent in Komisarek that was eager to listen and improve every day. "You could see right away that this kid had the talent and size, so the potential for a future NHLer was there, but it was his work ethic and determination that helped him right away," said the 25-year coach and winner of two national championships. "The key thing with young defensemen is to see how they're going to handle playing against upperclassmen who could be headed for the NHL the next season and are already really ready for that level. Mike handled that area very well. "He always took hockey and everything he did very seriously. He came from a strong family and was just a humble, hard-working kid. He was just a very coachable player and you could see that with all that going for him, this kid had the potential to be a big-time player." Komisarek said the two seasons (2000-01 and 2001-02) he played at Michigan built him into what he is today. Despite leaving for his dream to play in the NHL in the summer of 2002, Komisarek still believes he had a valuable experience playing under Berenson and treasures those days dearly. "Playing at Michigan basically built a foundation for me as a person and as a player," Komisarek said. "Without those couple of years there, I probably wouldn't be in the NHL right now. I just learned so much about life and hockey. When you're at a place like Michigan, it's really like playing for a pro team. The training facilities, the rink, the environment, it all prepares you for the next level." Komisarek is known as an intense, hard-nosed defenseman for the Canadiens and he credits that intensity to his college days. "When you play college hockey, you build yourself up all week in practice, getting pumped up for the two games on the weekend, and by the end of the week you're a cannonball waiting to explode out of the gun," Komisarek said. "Where as in the pros it's a longer season, more games, sometimes back-to-back in mid-week, and you have to pace yourself and play at an even keel. "Playing only two times a week, there was more intensity in every game, so I tried to combine that with the way I approach the game in the NHL. You're not going to be at full strength every game, but you try to have that motivation and passion you had in college." 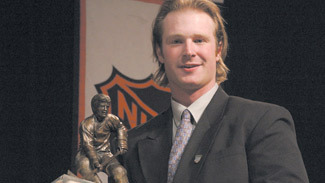 Following a 16-point freshman season, Komisarek was the seventh pick of the 2001 Entry Draft by Montreal. He stayed at Michigan for his sophomore season, when he had a spectacular 30-point campaign. When the Habs called that summer, Komisarek couldn't resist his dream of a chance to play in the NHL. "He matured a lot in his two seasons here, but the key was that even as he grew into a star here and now in Montreal, he has remained grounded and stuck to his goals. That's why he can handle it there and be the star he is." "I really did want to stay and I did want to get my degree because education had always been important in our family, but my dream was to play in the NHL, and when that opportunity comes knocking you can't refuse it sometimes, because you never know what will happen," Komisarek said. Berenson, a staunch supporter of college players staying for four years, was not happy, but understood every individual is different. "He had to do what he believed was right and that was always his dream to play in the NHL, so while I didn't like the idea at the time, he has paid his dues in the AHL and earned his spot on the Canadiens," Berenson said. Berenson played in Montreal and knows what a grind it can be there. But from his two seasons coaching Komisarek, he knew the humble kid from West Islip, N.Y., would succeed. "He matured a lot in his two seasons here, but the key was that even as he grew into a star here and now in Montreal, he has remained grounded and stuck to his goals," Berenson said. "That's why he can handle it there and be the star he is. I'm really happy for the kid because he deserves it."